A tranquil wine country escape. 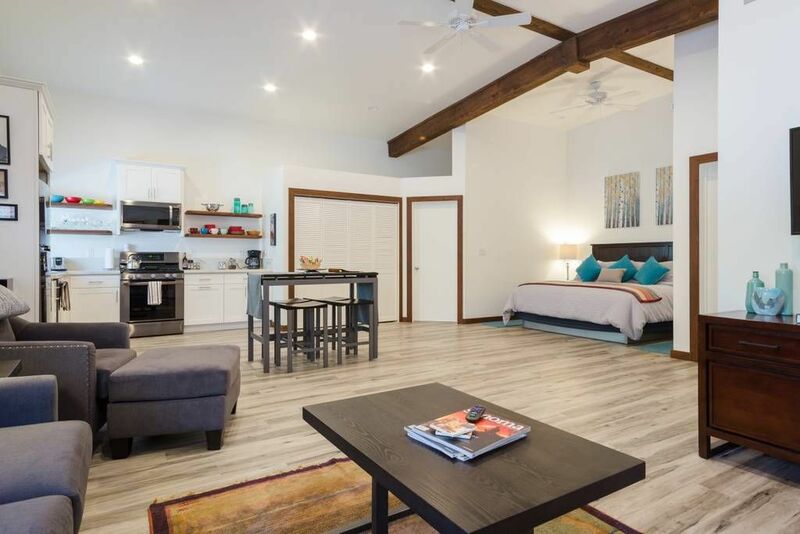 This private guest home was newly renovated from our beautiful and peaceful martial arts studio. With vaulted ceilings, you'll enjoy all new appliances, a luxurious living area and walk-in showers with heated floors. Bordering on the Fryer Creek bicycle path you’re just minutes from the historic Sonoma Plaza where you will discover boutique shops, cobblestone alleyways, historic landmarks, charming restaurants, and over 30 tasting rooms. There is a 12% Transient Occupancy Tax on Rates and Cleaning Fee. We enjoyed staying at Patrick's DJo. The property is well appointed and comfortable with plenty of room for 4 people. It is very conveniently located to downtown Sonoma (within walking distance) and to the wine country in Sonoma and Napa. The Patrick's are very welcoming and attentive to any need you have. We would definitely stay there again! Thanks for sharing your place with us and thanks for the wonderful wine and cheese that was waiting for us when we arrived. Great stay at the Dojo. It was well-appointed, clean, and comfortable for three people. Patrick was a great host. Looking forward to a return visit! Jim met us upon arrival and walked us through the property. He has a beautiful place that was comfortable for our family. He anticipated our every need and we enjoyed our stay. We would definitely recommend renting here. Enjoyed our stay. Everything we needed was provided...drinking water, snacks, and very comfy beds. Would have preferred two closed-in bedrooms, but the screens were helpful. The floors had been vacuumed but might need to be mopped as well. We had a bit of trouble adjusting the temperature, but that may have been our fault. Thank you! Thank you for your review and your candor. If you would be so kind, I am curious to learn if there was a particular part of the room where the floors seemed dirty? I have observed on many occasions that our house cleaners sweep, then use a swifter on the floor. I certainly want to maintain a very clean environment as you might imagine. Sorry about the temperature concern...I haven't been able to find a problem so far. Jim and Linda greeted us upon arrival and showed us around the place. Everything is just as the pictures look - a really nice, big bright space. We were only a group of 3 and had plenty of room. We were very close to everything and enjoyed the visit. Would stay here again and recommend if back in wine country! Thank you for your kind review, Sara. I hope you come back and visit us again, soon. Jim’s attention to detail is evident everywhere you look. From the cooking pots and utensils to the magazines and books to provide research for your holiday, comfort and preparedness sums it up. Jim was also responsive to all inquiries, even to printing boarding passes. Coffee and creamer in each bedroom let us enjoy fresh brew even on day one before going to the store. Thanks for the great place. Thank you, Jeff. It was a pleasure meeting you.